The Toshiba P505D-S8930 is a notebook laptop that hails from Toshiba’s L series. It incorporates stereo speakers and Wireless LAN antenna. The Toshiba P505D-S8930 sports a thin and light design and is targeted at the lower end market which demands for budget notebooks. In general, the Toshiba P505D-S8930 measures 17.4 inches x 11.6 inches x 1.6 inches (W x D x H) in dimension and weighs approximately 9.7 lbs. Its design sports a fusion finish with sonic pattern in black onyx. The Toshiba P505D-S8930 incorporates an AMD Turion X2 mobile processor RM-74 processor of 2.2 GHz that incorporates Dual-Core technology and has a data bus speed of 800 MHz. Not only that, it also incorporates an AMD M780G chipset and has 1 MB of L2 Cache. In terms of system memory, the Toshiba P505D-S8930 comes pre-installed with 4 GB of DDR2 technology SDRAM at 800 MHz with an option to expand up to a maximum of 8 GB of SDRAM. The Toshiba P505D-S8930 has two SDRAM slots. In terms of physical storage, the Toshiba P505D-S8930 incorporates a Serial ATA hard disk drive that utilizes an S-ATA 150 interface with up to 320 GB of storage capacity at a speed of 5400 rpm. Not only that, it also has a built-in DVD +/- RW (+/- R DL)/ DVD-RAM optical drive. It has a CD/ DVD read speed of 24x for CD and 8x for DVD, a CD/ DVD write speed of 24x for CD, 8x for DVD +/- R and 6x for DVD +/- R DL, as well as a CD/ DVD rewrite speed of 24x for CD, 6x for DVD-RW, 8x for DVD +RW and 5x for DVD-RAM. The Toshiba P505D-S8930 also sports a widescreen display that incorporates TruBrite features and has a maximum WXGA resolution of 1680 x 945 pixels. In terms of memory features, the Toshiba P505D-S8930 incorporates an ATI Radeon HD 3200 HyperMemory graphics processor with up to 256 MB of video memory and a maximum allocation of 1662 MB of RAM size for graphics. 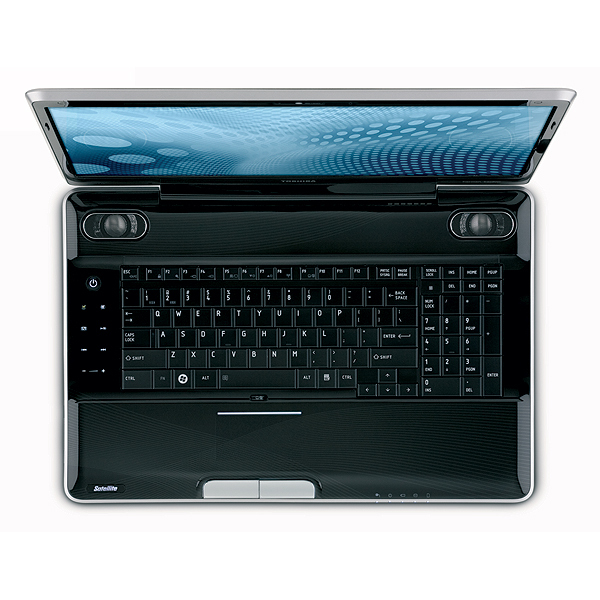 As for audio features, the Toshiba P505D-S8930 incorporates a sound card also has a built-in microphone. Input devices are in the form of a keyboard and a touch pad with the touch pad layout and localization according to US standards. Besides that, the keyboard also features Toshiba EasyKeys. In terms of communications, the Toshiba P505D-S8930 incorporates a network adapter that has support for Wireless LAN and complies with Ethernet, IEEE 802.11 b, IEEE 802.11 g and Fast Ethernet data link protocols. Not only that, the Toshiba P505D-S8930 is also Wi-Fi certified. In addition to that, it also has an available ExpressCard slot. Interfaces include a display/ video VGA 15 pin HD D-Sub (HD-15) port, a microphone input mini-phone 3.5 mm jack, a headphones output mini-phone stereo 3.5 mm jack, a network Ethernet 10 Base-T/ 100 Base-TX RJ 45 port, and three Hi-Speed USB 4 pin USB Type A ports. The Toshiba P505D-S8930 is powered by a six cell Lithium Ion battery that has a capacity of 4000 mAh. Alternatively, it can also be powered by direct current via its provided power AC adapter with a voltage requirement of AC 120/ 230 V and provided power of 65 W. The Toshiba P505D-S8930 operates on a pre-installed genuine Microsoft Windows Vista Home Premium operating system. It comes pre-loaded with software including Skype, Norton 360, Google Picasa, Google Desktop, Google Tollbar, Toshiba Assist, Toshiba Resources, LoJack for Laptops, Toshiba ConfigFree, Toshiba DVD Player, Microsoft Works 9.0, Adobe Acrobat Reader, Toshiba Disc Creator, Toshiba Speech System, Toshiba Hard Disk Recovery, QuickBooks Financial Center, Toshiba Value Added Package, Toshiba Recovery Disk Creator, Wild Tangent Orb Games Console, Sun Java 2 Runtime Environment, Ulead DVD MovieFactory 5 for Toshiba, Toshiba Extended Tiles for Windows Mobility Center, and Microsoft Office 2007 Home and Student Edition (60 day trial). The Toshiba P505D-S8930 comes under a one year limited warranty.